Africa is rapidly becoming a popular destination for couples on Honeymoon, with ultra luxury safari lodges, amazing wildlife and secluded tropical Indian Ocean Islands providing the most exclusive and romantic getaway. London, UK (PRWEB) September 10, 2007 -- Africa has always had a certain mystery, a romantic aura about it, however, in years gone by it was never really regarded as a top honeymoon destination. "In recent years this has all changed, with Safari Lodges becoming ever more upmarket and now offering services and facilities such as private pools, Jacuzzis and spas that compare favorably with the very best hotels and resorts around the world," states Stuart Parker Managing Director of Africa Uncovered a company that prides itself on offering unique tailor made safaris to some of Africa's finest destinations. Gone are the days of roughing it in small tents where many a sleepless night was endured trapped in small canvas surrounds, listening to the mysterious sounds of the African night. 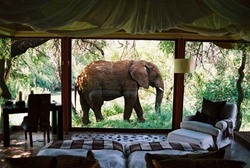 With the advent of the "Luxury Safari Lodge" there has been a new type of traveler drawn to Africa's majestic, untouched beauty -- Honeymooners. Considering the fantastic mix of wildlife, amazing scenery, clear skies, warm and friendly people and pristine beaches, its not difficult to conclude that Africa has the perfect ingredients for the ultimate Honeymoon. Watching the most unreal of natural events the "Great Wildebeest Migration" on a Tanzania Safari or a Kenya Safari and then relaxing on the romantic spice island of Zanzibar is an excellent and extremely popular way to spend a Honeymoon in East Africa. Some Honeymooners require real exclusivity and thus favor a Botswana Safari combined with a couple of days at the Victoria Falls and then on to a secluded island off the coast of Mozambique. Whatever the requirement, for those seeking something special and who want to be "wowed" whilst on Honeymoon, Africa is a destination that is difficult to beat.